Never underestimate the power of the Pushchair! I have written a post which is currently being featured on the fabulous blog, Life, Love and Dirty Dishes, which is written by the wonderful Claire. Claire is a married mummy to 2 gorgeous little lads and she is a bit of a blogging Oracle in my eyes. She is one of the first bloggers I began reading regularly and I just love how she writes. Funny, sincere, real and heartwarming; her posts always manage to hit the right spot. She loves chocolate, wine and Gerard Butler – all 3 of these things uniting together would pretty much place Claire in her idea of heaven…and who can blame her?! Claire runs a series called, Rookie Mistakes, and my post, all about The Terrible 2’s and the power of the Pushchair, is currently being featured in this series. It’s a place where bloggers can share their experiences of parenthood, and inform you all of stupid things they have done which were, inevitably, a bit of a learning curve them. I have made many of these Rookie Mistakes myself…hence my love for Gin. 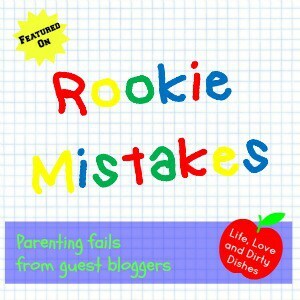 You can read my guest post for the Rookie Mistakes series, here! If you would like to show Claire some love, you can find her over at these places. She really is rather super and loves making new friends! Go and say hello! Thanks for having me Claire, you’re very brave, and I really appreciate it! Fabulous story, as usual! My young grandson is one year old this Sarurday and is the most perfect cuddly cute angelic cherub there ever was. Next time I see him, you are telling me he will be the devil child, son of Satan! That’s a bit worrying…..
GeorgieMoon recently posted…When I was a tourist….